I truly respect the fact that great people are often humble and unpretentious. Especially in the era of Social Media, where everyone else is trying to show off and state their presence. They could even be described as ‘antisocial’. Thanasis Parparousis is such a rare case. 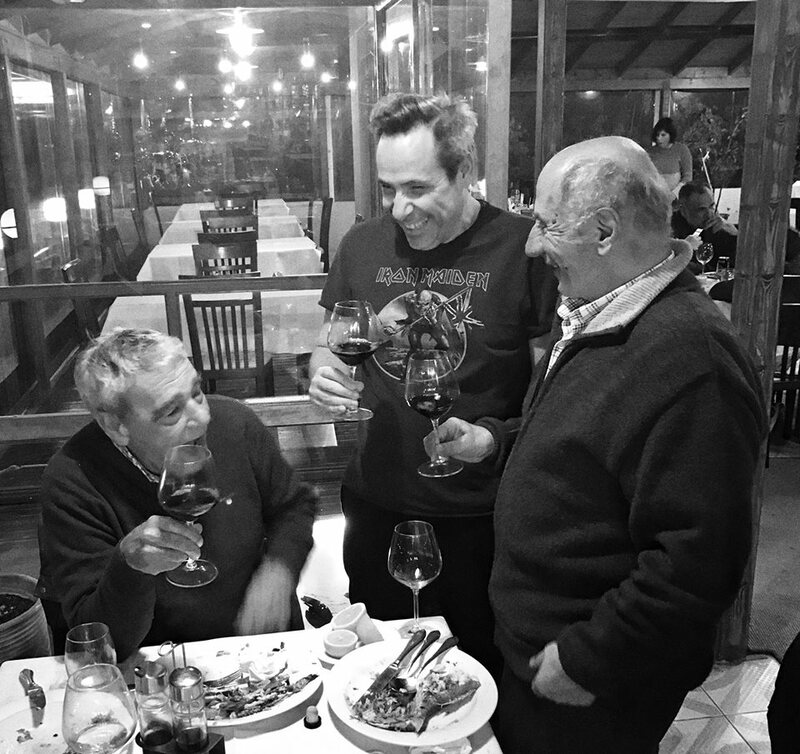 He belongs to the historic first group of Greeks, who were trained (DNO) as oenologists in Bordeaux, together with Gerovassiliou, Voyiatzis, Fakorellis and others, and whο transformed the Greek wine scene in the 70s. He is a quiet man with a lot of hidden power. The following chat took place last week in Κatakolo in the Peloponnese after I initially ran into him by chance in a local fish tavern. He was having dinner with another iconic Greek producer, Christos Kokkalis (pictured below). The next morning, when I came down to breakfast, there he was again. As I say, I never plan my posts. Posts find me on the way. YK: What is wine for you? TP: What I learned early on in my life, even from the times of my oenology studies, is that wine is a cultural product. But you need to have sense of aesthetics and beauty to assess its value. YK: Where is Greek wine today in an international context? TP: We need to produce wines of added value, wines that can age, always bearing in mind what the current situation is like. In the previous years we had inflation, now we still have a crisis, but you have to age your wines if everyone else does so. Even though there is a trend in France for wines that offer more immediate pleasure. I believe, that we have eventually moved forward from the USA impressive, rich, full-bodied style of wines; a style which was unfortunately adopted by Greek winemakers and kept us behind. We have reached the next level with Greek wines that are in many cases, very special and exotic. We have a very small production, a pot of flowers, we only account for the 1.8% of the E.U., 1% of the global production, a number that can fall even lower as competition rises across the market. Greeks possess only 0.5 to 1 hectare of land whereas in the new world that figure rises up to 1.000ha. We need to specialize more if we want to continue to exist. We need to start our work with the vine. YK: Have things improved over the last years? TP: Even small wineries, much like myself (120.000 bottles), sell in the metropolises of the world and that fact says it all. When you sell in New York, London, Tokyo, it means you have broad acceptance. What we still miss is top quality. This is the missing link. YK: And how we can get there? TP: With two actions. Care of the vine comes first. I believe you need to have smooth cultivation methods. So you can express your terroir and I am not talking about plants with yields that are unreasonably high. I am talking about a vine that can stand the test of time, aging and most importantly have aromatic elements, to live from the soil, to have it's own flora and fauna. On the other hand, you also need to have wines from good vintages you can put aside and forget. So you can stock up on aged bottles and increase the prices. YK: How does the novice consumer in Greece comprehend Greek wine? TP: As long as many people, and especially the young generation, go for “hard liquor” (mostly for financial reasons), we cannot talk seriously about wine. Another category of consumers are those who have a consistent, business-like relationship with wine. Those people go for fruity wines, in the beginning. The percentage of Green wine lovers that have been trained abroad are the "spark" for us to grow. I wouldn't say they constitute a large percentage, but they are the evangelists that will take Greek wine further. YK: Still staying in Greece, bottled wine or bulk wine? Which one is preferred? TP: People in Greece drink mostly bulk wine. Caused partly by the special taxes that apply to bottled wine (can be up to 50%). Bottled wine still has a long way to go to find its deserved place. We are getting there very slowly. YK: You are one of the pioneers of dry Mavrodaphne. What do you think of its potential? TP: Actually I started vinifying dry Mavrodaphne in 1975. Most people know about the sweet stuff, a substitute for Port, especially during the phylloxera period. The dry version is a rewarding wine. It has friends and foes. But what I think is a fact is its complexity. It definitely needs time to open up even in the glass. ΥΚ: How difficult is it to change the legislation concerning dry Mavrodaphne? Now, for example, Parparoussis Mavrodaphne is called Taos and you cannot mention the variety on the label. TP: Unfortunately, the pace at which legislation changes is very slow. In the past we had suggested the establishment of a professional body that would be in charge of any legislation to do with Greek wine, but the Ministry prefers to keep the legislative power within the state. The Ministry says that if the legislation changes it will interfere with sweet Mavrodaphne, which has a history of 2 centuries. However, when you drink a sweet wine you always drink less and a Sweet Mavrodaphne will not expand your experience. We will not be stopped by that. We will change its name to "Tsiggelo", which is it's best clone, and that is final. YK: How do you evaluate Greek legislation in the year 2019? TP: We always take slow steps, when we could be doing many things. For example, we could allow Greek varieties to be produced everywhere, in the whole of Greece. Just like the French have done with their wines. Why shouldn't we have the weapons to fight? Would the varieties change if they could be cultivated anywhere in the country, wherever the terroir allows? Greek wine needs to decide for itself, instead of having the government do so. There are many issues and challenges. YK: How do you see the new waves that have involved natural wines in Greece? TP: The whole situation is quite an oxymoron. Are there the natural wines on one side, and "unnatural" on the other? YK: The term has failed. TP: I believe that a wine, like the vine, needs to be assisted through gentle methods to achieve quality. You cannot leave a wine on its own, with the precipitates or without antioxidants. I am not biased against it but it is a trend that cannot be taken too far. TP: Because it does not have the inner abilities. Wine needs to have a redox (Reduction-Oxidation) potential, a few millivolts. In natural wines we always go to a category of oxidised wines. We used to have the same trends in earlier ages. In Crete, for example, they used the same pot to store the wine and drink it. It matched the food, though, as they eat many salty dishes. The new natural wines are more refined, they are a new line of the old examples. YK: Do you taste wines from other producers? YK: When you taste wines produced in 2018, do you spot characteristics that bother you? TP: What bothers me is the uniformity of character attributed to common yeasts and enzymes. Things that make all the wines the same and you cannot even tell the variety. Tragic. Much like in cheeses. YK: Let’s talk about classic red regions. How is Nemea performing? TP: Much has been invested in Nemea and many wineries have opened. Now a second revolution needs to be made towards real quality. YK: How is Nemea Parparoussis different from other Nemea wines? TP: It is different I would like to believe. First of all it is from vines in Gymno and from grapes we cultivate with care and mild methods. We follow their needs. The personality then; it is a wine that does not shout, but it possesses the elegance and complexity of Burgundy wines. YK: And how about Naoussa's potential? TP: Naoussa has solid aging potential. People like the Boutari company used to establish different prices for grapes according to quality. Unfortunately it did not survive because of the crisis. YK: Which wines do you enjoy drinking? TP: Wines like last night's Christos Kokkalis Trilogia 2009. A complete, layered wine with personality. Wines from Nemea and Naoussa as well. 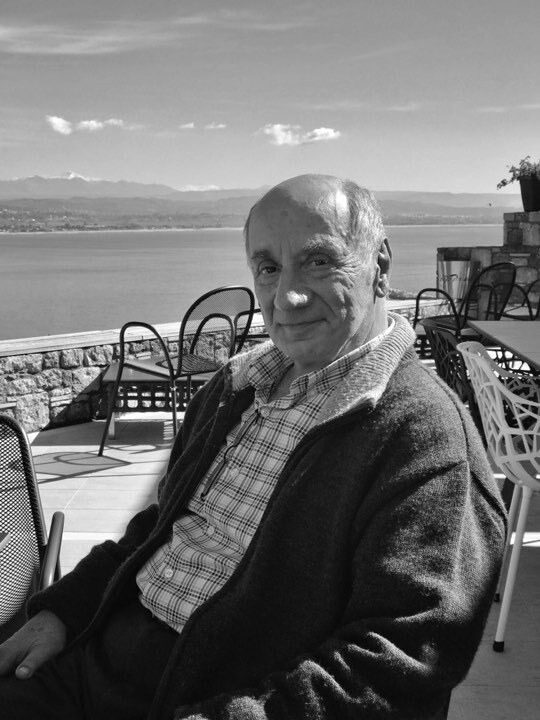 I remember meeting Thanasis and his daughter at a tasting in a monastery-like resort in Patras few years ago. Their wines had so much character, delicious and savory. I did taste their Muscat Rio Patras at the time that I thought was a great expression of the grape and the style of wine. I was happy when back at home I found the wine in distribution to feature it as part of my wine program. A beautiful conversation with a very wise man. His view of the natural trend is absolutely accurate in my view. Once an experienced and skilled winemaker decides to give wild yeasts, old amphora or skin contact to give his/her wines a new voice, I see it as brave and artistic. I also trust their judgement, as their reputation and livelihood is on the line.